WhatsApp Messenger has become one of the most used applications of iOS devices for years ago and it is still one of those applications on AppStore. Permissions of the application is very important for the application users and we are going to give information about permission settings and features of them on this page. If you are using an Android device, you can learn more with our Android permissions guideline. Where is WhatsApp Permissions on iPhone? Let’s give you information how to find these permission settings on your iPhone and iPad device first for those who just started to use the application. Swipe down until you see WhatsApp icon and tap on that. You will see all options for permissions. Now you can change/check them. 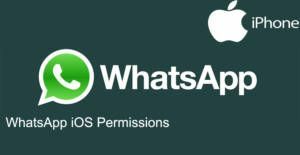 You can find some WhatsApp iOS permissions below. You will also find information about them. You should certainly enable contact permission on WhatsApp. Otherwise you won’t able to use the application as you wish. If you disable contacts, you cannot see names of the people who are writing you on the application. People who are using the application for the first time making a mistake with disabling this feature. We recommend you to enable it, if you want to use the app effectively. This permissions allow you to use your pictures on WhatsApp. People are using pictures on their phone gallery very often on WhatsApp. Allowing WhatsApp to access to your pictures won’t give you any trouble with security of the application. If you disable it, you won’t share any picture on your Gallery. Microphone is needed for video calls, voice calls and audio sharing on the application. If you don’t want to use one of these features, you do not need to enable this. If you are using one of these features, you will need to give access for microphone to WhatsApp. Camera is also needed for video calls as same as microphone. If you disable camera on WhatsApp, you cannot use video call. You also need it for taking pictures with WhatsApp. If you enabled camera but if you still have problem with detecting it, you can read our guide about that. You can set your notifications as you wish since it depends your location and situation. If you have any questions regarding WhatsApp iOS permissions, please let us know. Should I allow WhatsApp to reach my contacts? What will happen if I allow it to reach my contacts? I am new on WhatsApp. I have a question about settings on WhatsApp iOS. If I enable WhatsApp to access pictures, can someone else see them? Nice question for a beginner. You will only allow application itself to access your pictures. The permission is only about this. No one else will see your picture until you want people to see your picture. (Except profile photo but there are also settings of it.) You can only do it via sending them pictures via WhatsApp. So enabling WhatsApp to access pictures won’t hurt anyone’s privacy. If I block photos, can I still video call people? Yes, you will still able to video call people with WhatsApp if you block photos. You won’t just reach to gallery if you want to share photos from your iOS device.